The beautiful locality Sierra de la Ventana is located in the laps of the Sierras of the same name. It is a symbol of life in the open air and the contact with nature. This beautiful mountain tourist centre shows buildings as country houses and chalets of modern style, surrounded by a landscape of mountains, brooks and leafy vegetation. It has a nice weather, with a sky that is habitually clear and blue. The locality is conformed by different neighborhoods and villages: Villa Tívoli, Parque Delfino Neighborhood, San Bernardo Neighborhood, Parque Golf Neighborhood, Villa Arcadia, Valle Hermoso and La Cumbre Neighborhood. This is a proper place for resting and also this landscape is the ideal frame for recreation and the practice of active tourism like rapel, parapente, trekking, mountain bike and horse ridings, among others. The sports and the recreation also find their place in these lands because the locality has one of the best golf courses in the country. The trout sport fishing which are caught in Sauce Grande brook and its affluents is another possibility. Its proximity to Ernesto Tornquist Provincial Park, allows the tourist to make many excursions and ascents to the highest mountains of the system, to know natural formations like Hueco de la Ventana (that gives the name to the locality), to visit many waterfalls, cave paintings and to observe beautiful panoramic sights. The city is also the seat of the Provincial Festival of Reyes Magos. Cabañas en Sierra de la Ventana. Información detallada, imágenes, precios y descuentos de Cabañas en Sierra de la Ventana. Excelentes ofertas de Cabañas en Sierra de la Ventana. Detalles e información de alojamientos en la ciudad de Sierra de la Ventana. 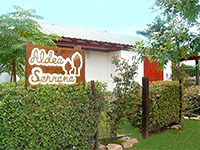 Cabañas , Aparts y spa para disfrutar de las vacaciones junto a toda la familia. Consulta los precios de cabañas en Sierra de la Ventana. Tenemos el listado más amplio de Cabañas y Aparts baratos en Sierra de la Ventana y alojamientos de primera categoría. Además, información de excursiones, paseos y rutas gastronómicas.